KIRBY, WILLIAM, author, tanner, journalist, teacher, and public servant; b. 13 Oct. 1817 in Kingston upon Hull, England, son of John Kirby and Charlotte Parker; m. 23 Nov. 1847 Eliza Magdalene Whitmore in Niagara (Niagara-on-the-Lake), Upper Canada, and they had three sons, one of whom died in infancy; d. 23 June 1906 in Niagara-on-the-Lake, Ont. William Kirby was the son of a currier and his wife who lived in Kingston upon Hull. According to his own account, a great-grandmother was a loyalist from Virginia whose family had been driven back to England by the American revolution; although he knew of her “through tradition” only, her stories, particularly of George Washington whom she “hated . . . for his disloyalty,” were often told. In the 1820s Kirby lived with his paternal grandparents in Newby Wiske, where he took his “first lessons” in 1825. He completed his education in Cincinnati, Ohio, where John and Charlotte and their six children immigrated in 1832. His teacher was Alexander Kinmont, a Scot, whose school Kirby attended when he was not working as a tanner with his father. Here, as well as learning such subjects as Greek, Latin, French, and German, he acquired a lifelong interest in the philosophical and religious principles of Emanuel Swedenborg. After returning to the Niagara region in September, Kirby worked as a tanner, first at St Davids, and later at Four Mile Creek. This career ended in the mid 1840s, however, when his partner absconded, and Kirby, unable to pay their debts, ended up bankrupt. He then taught school until he settled permanently in Niagara shortly after his marriage in 1847 to a granddaughter of one of the original United Empire Loyalists in the area. In 1850 he became the editor of the Niagara Mail; he remained actively associated with this newspaper, which he bought from Alexander Davidson* and his son in 1853, until the 1860s. During these years he became involved in the local community. In 1856, for example, he was made a magistrate for Lincoln County, and in 1861, reeve of Niagara. And he found himself ever more concerned with what he saw as the needs of Canadian history and literature and the issues of national importance in Canadian politics. Often he combined these interests. “On the sickness and retirement of His Excellency Lord Metcalfe from the government of Canada, Nov., 1845,” which is usually described as Kirby’s first publication, appeared in the Niagara Chronicle on 31 Dec. 1845. 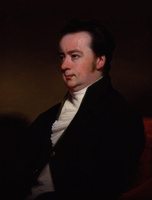 Written in blank verse, the poem praised Charles Theophilus Metcalfe* as “the wise and good, the sure defence / And bright adornment of our northern land!” Another early work was “Counter manifesto to the annexationists of Montreal,” in which Kirby inveighed against the Montreal merchants who had proposed that Canada should join the United States. “With God’s help,” he stated in the first paragraph, “I trust to . . . convict you before heaven and earth, as the most reckless, causeless, unreasoning and selfish batch of revolutionists, that ever disgraced the calender of political crime.” Like “the priests of Baal,” he continued, the merchants danced round “the graven image of Annexation” and called on Canadians “to fall down and worship” this “pseudo God. But like the faithful men of Israel we laugh at you with scorn and derision, – we will hew your idol in pieces, and burn its priests in the fire that consumes it.” First published as a letter in the Niagara Mail on 31 Oct. 1849, it was reprinted in pamphlet form, in several thousand copies, by the Canadian government. Diverse as these items were, they signalled the major themes of Kirby’s life and works: a distrust of the United States; a love of the British monarchy and empire; a belief in the nation of Canada; a reliance upon the will of God for personal and communal guidance; and an interpretation of historical events that emphasized, often with biblical imagery, the destructive presence of evil in a fallen world. 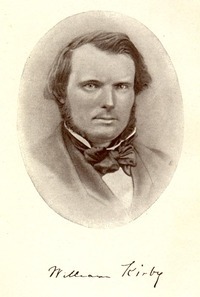 Throughout the 1860s and 1870s Kirby pursued both his public and his literary interests. In 1863, for example, he became curator of the military reserve at Niagara and he campaigned against the proposal to move the county town from Niagara to St Catharines. In 1866 he helped organize a home guard to defend against the Fenians at Fort Erie [see John O’Neill*], and in 1867 he worked for the local Conservative candidates in the federal election. In the latter year a celebration of “Our glorious Dominion,” “Canadians forever, a national song,” was printed at Niagara as a broadside; a copy that he sent to Alfred, Lord Tennyson, marked the beginning of a correspondence between the two. Having chaired a committee on education in Lincoln County in 1869, Kirby became president of the Niagara Mechanics’ Institute four years later; he remained president of its library, which became the Niagara Public Library, until 1903, when he was made its honorary president. In 1876 “Joseph in Egypt,” Kirby’s “dramatic entertainment,” was presented at Niagara as a benefit for the library. In the same year “The sparrows: on seeing a flock of English sparrows at my door, on the shore of Lake Ontario, December 10th, 1876” was printed by the Niagara Mail; Kirby stated later that this poem, which ends “The sparrows trusted thee – trust thou thy Lord,” represented his religious feelings. Kirby’s most lucrative appointment occurred in 1871, when he was made collector of customs at Niagara. At least partly a reward for his service to Sir John A. Macdonald* and the Conservatives, this position provided him with the financial security that he needed to complete his most important work. His interest in the legend of the Golden Dog had been renewed in 1865 when he spent several weeks at Quebec. During this time a copy of James MacPherson Le Moine*’s Maple leaves: a budget of legendary, historical, critical, and sporting intelligence (1863), which included a sketch of “Château Bigot” and of “Le chien d’or – The golden dog,” came into his hands; he read the volume “with great interest” and discussed it with his friend Benjamin Sulte*: “We talked much of Chateau Bigot and the Chien d’or,” he informed Le Moine in 1877. “I wanted Sulte, as a clever French Canadian, to write the story, and finally half in jest, half in earnest, threatened him, that if he would not write the story of the Chien d’or I would – ! – That was the beginning of it.” For the next several years Kirby read copiously about 18th-century New France; Sulte and others sent him material. In June 1872 he informed a correspondent that he was “writing the last chapter of the book.” It was almost another five years, however, until The chien d’or/The golden dog: a legend of Quebec was published by Lovell, Adam, Wesson and Company of New York and Montreal [see John Lovell*]. During this period Kirby’s version of the legend grew into a complex vision of New France in the years before its conquest by the British and an epic rendering of this seminal epoch in Canadian history. Kirby opens his story in 1748 with a comparison of Quebec and “this bright Canadian morning” to Eden. As his narrative unfolds, however, Satan in the form of Intendant François Bigot* and his followers destroys the garden of New France and the lives of many innocent people therein. Although Kirby suggests that the fall of France’s North American colony was in some ways ordained by God to preserve it from the republican excesses of the French revolution, the “tale . . . ends in all sadness” and without either “poetic” or “human justice.” The tragic ending underlines his reading of history as a struggle between good and evil where, although good sometimes wins, it does so only at huge cost and with enormous difficulty. Kirby dedicated his novel to Maria Susan Rye in admiration of her work with destitute children. Rewards and recognition followed the publication of The golden dog. 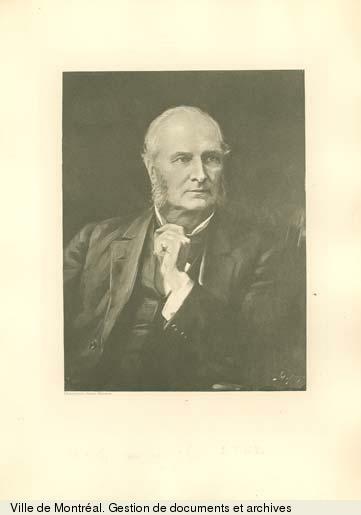 Kirby was, for example, a founding member of the Royal Society of Canada in 1882; one of his chief activities was to work through it for better copyright laws for Canadian authors. But basically his life did not change. He lived in Niagara, where his wife died in 1891, and worked as collector of customs until forced to retire in 1895. He took part in various local activities, especially those that had to do with Canadian history; in 1891 he was president of a short-lived historical society, and when the Niagara Historical Society was founded in 1895, he became its patron. Above all, he thought about Canada’s relations with Great Britain and the United States. 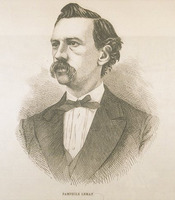 In a series of letters to George Taylor Denison*, he outlined his views on such matters as commercial union with the United States and imperial federation. Goldwin Smith became his bête noire; he was “the arch Lucifer” who would cast Canada “into the Hell of Yankee continentalism.” Imperial federation, on the other hand, would protect Canada from the United States. And he wrote both poetry and prose. Many of Kirby’s poems were occasional. “Lord Lorne in the North-west,” for example, a sonnet published in the Canadian Methodist Magazine in December 1881, commemorated a visit by the governor general to the “Green prairies,” “great rivers spelling / Their rugged names in Blackfoot and in Cree,” and “The snowy mountains” of the North-West Territories. To this magazine Kirby also contributed poems that eventually became part of a series called “Canadian idylls.” One of them, “The hungry year” (February 1879), told the story of the hardships faced by the loyalists on the Niagara frontier. In 1888 Kirby bound the previously printed poems together in a volume and copyrighted them as Canadian idylls; a new edition of Canadian idylls was published in Welland, Ont., in 1894. In 1895 Kirby, who commented frequently on the need to “imbue the minds of the rising generation with knowledge . . . of Canada’s history,” began what was to become his last published volume, an anecdotal and discursive history of the Niagara region, prepared for and issued the next year by the Lundy’s Lane Historical Society of Niagara Falls Village (Niagara Falls). In a letter written to Denison in December 1896, Kirby announced that his new work was “Canadian to the finger and toe ends! – yet true & just and fair, as ever I could make it.” A second edition was prepared by Lorne Pierce* and published in 1927. The elegiac tone that marks the final lines of Annals was often sounded by Kirby in the 1890s. Writing to Denison in October 1896, he remarked, “Last Tuesday 13th was my birth day, when I completed my 79th year having I think nearly done my work, and I hope my duty in this world, which I always regard as only the vestibule of another life which is to last forever, and for better or for worse as we have made our character and fitted ourselves for it here.” In fact, although he increasingly felt “the weight of years” and was often too ill to attend meetings, he kept up a lively interest in his favourite topics. In 1903, for example, he was incensed enough at a proposal to erect a statue of George Washington in St Paul’s Cathedral in London to prepare an article expressing his objections. Washington’s “sole distinction,” wrote Kirby, “was that he broke up the British Empire and persecuted with rancour, even unto exile or death, hundreds and thousands of loyal Americans who opposed the rebellion of which he was chief and leader.” The loyalist stories that he had heard in his youth stayed with him until old age. Kirby’s death in 1906 was widely noticed in Canadian newspapers. He was buried in the churchyard of St Mark’s Church (Anglican) in Niagara, where he had worshipped for many years. He had been, as the subtitle of his biography by Pierce makes clear, a “tory loyalist” who held fundamentally conservative views about the nature of man and his need for strong, hierarchical governance. But he was also a Canadian nationalist with progressive ideas about the future of Canada as a bicultural, bilingual country whose heritage included that of both England and France, whose colonial past was heroic, and whose present as a large dominion was full of promise. His convictions that this promise was dependent on the two criteria of continued freedom from the United States and continuous relations with Great Britain and her empire formed, then, part of a coherent plan to assure the present survival and future independence of a “glorious” Canadian nation. The grandeur of his vision, articulated most splendidly in The golden dog, undoubtedly explains why he and his novel have played such an important role in the shaping of the national consciousness of so many Canadians. [In spite of the fame of William Kirby and The golden dog, few of his works are readily available, and the only paperback edition of The golden dog currently in print is a greatly abbreviated version in the New Canadian Library series (Toronto, 1969). A scholarly edition is being prepared by Mary Jane Edwards and Elizabeth Brady for the Centre for Editing Early Canadian Texts, Carleton Univ., Ottawa. Modern reissues of two of Kirby’s other works are available: the 1896 version of Annals of Niagara was republished by the Lundy’s Lane Hist. Soc. of Niagara Falls, Ont., in 1972, and a reprint of The U.E., a tale of Upper Canada appeared at Toronto the following year. Pamphile Le May’s translation of The golden dog was serialized in L’Étendard (Montréal) as “Le chien d’or! Légende canadienne,” 30 août 1884–16 févr. 1885, and then published in a monograph version entitled Le chien d’or: légende canadienne (2v., Montréal); the title-page is dated 1884 but it actually came out the following spring. It has appeared in several subsequent editions, detailed in the article by D. M. Hayne, cited below; a new edition, with an introduction by Roger Lemelin*, has since been issued (2v., [Montréal], 1989). In addition to the works cited in the text, William Kirby’s writings include the autobiographical account “A reminiscence of two days in Quebec, July, 1839,” Quebec Chronicle, 26 Jan. 1903: 4 (reprinted as Reminiscences of a visit to Quebec, July, 1839, n.p., ), as well as numerous other items, many of which were issued pseudonymously in Canadian newspapers. The most complete collection of these publications can be found in Kirby’s papers at AO, F 1076. There is also material relevant to Kirby in the Lorne and Edith Pierce Coll. of Canadian mss at the QUA (the archives also holds a manuscript copy of “The golden dog”); in NA, MG 29, D72, D91, and E29; and in the Niagara Hist. Soc. Museum (Niagara-on-the-Lake, Ont.). “Old and new,” Gazette (Montreal), 25 April 1903: 11 (citing letter from William Kirby to R.V., 13 April 1903). Alfred, Lord Tennyson, and William Kirby: unpublished correspondence to which are added some letters from Hallam, Lord Tennyson, ed. Lorne Pierce (Toronto, 1929). Elizabeth Brady, “A bibliographical essay on William Kirby’s The golden dog, 1877–1977,” BSC Papers, 15 (1976): 24–48. Janet Carnochan, “Reminiscences of William Kirby, f.r.s.c.,” United Empire Loyalists’ Assoc. of Canada, Annual transactions, 1904 to 1913 (Brampton, Ont., 1914), 49–56. Dennis Duffy, Gardens, covenants, exiles: loyalism in the literature of Upper Canada/Ontario (Toronto, 1982). L. R. Early, “Myth and prejudice in Kirby, Richardson, and Parker,” Canadian Lit. (Vancouver), no.81 (summer 1979): 24–36. Carole Gerson, A purer taste: the writing and reading of fiction in English in nineteenth-century Canada (Toronto, 1989). H. P. Gundy, “The manuscript of Kirby’s The golden dog,” Douglas Library Notes (Kingston, Ont. ), 6 (1956–57), no.1: 1–3. D. M. Hayne, “The golden dog and Le chien d’or: Le May’s French translation of Kirby’s novel,” BSC Papers, 20 (1981): 50–62. E.-M. Kröller, “George Eliot in Canada: Romola and The golden dog,” American Rev. of Canadian Studies (Washington), 14 (1984): 312–21. Joy Kuropatwa, “Dante & ‘The golden dog,’” Canadian Lit., no.86 (autumn 1980): 49–58. Margot Northey, William Kirby and his works (Toronto, 1989). G. L. Parker, The beginnings of the book trade in Canada (Toronto, 1985). Lorne Pierce, William Kirby: the portrait of a tory loyalist (Toronto, 1929). W. R. Riddell, William Kirby (Toronto, ). David Sinclair, “William Kirby and the production of The U.E.,” BSC Papers, 9 (1970): 30–35. J. R. Sorfleet, “Fiction and the fall of New France: William Kirby vs. Gilbert Parker,” Journal of Canadian Fiction (Montreal), 2 (1973), no.3: 132–46. Mary Jane Edwards, “KIRBY, WILLIAM,” in Dictionary of Canadian Biography, vol. 13, University of Toronto/Université Laval, 2003–, accessed April 25, 2019, http://www.biographi.ca/en/bio/kirby_william_13E.html.